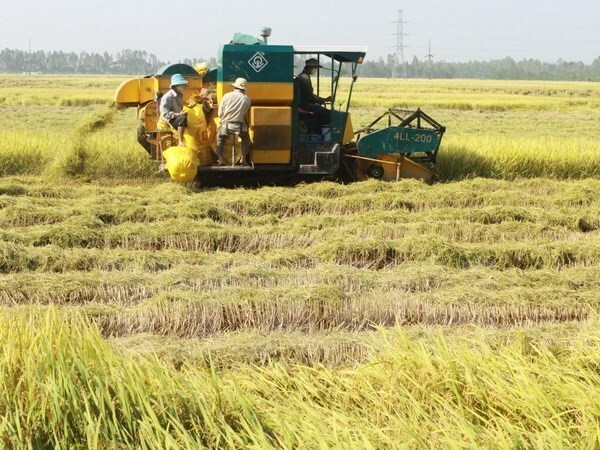 Hanoi (VNA) – The recent credit package worth 100 trillion VND (nearly 4.4 billion USD) for hi-tech agriculture is expected to give a breath of fresh air to Vietnam’s agriculture amid the recurrent problem of “bumper crop, sliding prices”. Deputy Governor of the State Bank of Vietnam (SBV) Dao Minh Tu told Vietnam News Agency that eight commercial banks have committed to loaning more than 100 trillion VND under this package. Outstanding loans for the application of high technology in agriculture have totalled 26 trillion VND (over 1.1 billion USD), which was given to 3,957 individuals and 64 businesses. Of that sum, 21.7 trillion VND (954.36 million USD), or 84 percent, was provided for hi-tech agricultural activities. The remaining 4.3 trillion VND (189.1 million USD) was loaned to projects in clean agriculture. There haven’t been any bad debts reported so far, Tu noted. Before giving loans, banks have to consider whether borrowers are able to pay off their debts, he said, taking pig farming as an example. If farmers cannot sell their pigs like what has happened recently, bad debt will immediately appear. If the market demand is not taken into account when investing in agricultural activities, products will become unsalable, he stressed, adding that Prime Minister Nguyen Xuan Phuc had emphasised the need to consider supply and demand while promoting hi-tech agriculture. Criteria for determining projects eligible for the credit package targeting hi-tech or clean agriculture production and business are detailed in Decision 738/QD-BNN-KHCN, dated March 14, 2017, of the Ministry of Agriculture and Rural Development. Commercial banks pledge to give short-, medium- and long-term loans at annual interest rates that are 0.5 – 1.5 percent lower than the normal lending rates of the same loan terms. Banks arrange capital sources for the credit package by themselves.